This episode, I'm going solo talking about boiling the milk. The basic concept here is the importance of taking care of devotees and training them. Looking after the devotees we have rather than just going out and making new devotees. 8:32 What does boiling the milk mean? 9:03 Where does the expression come from? 9:54 What do we need to focus on? 13:22 How should we speak when we preach? 13:55 Are your actions matching what you say? 14:42	How to help devotees think for themselves. 15:47	What are devotees needs? 17:17 How things have changed… new challenges. 23:13 Essential factor in future success of our movement. 35:55 How to boil the milk? Krsnendu: But preaching doesn't just mean making new people into devotees. It means cultivating the people that become devotees and really developing them. It's time to get inspired. Join us as we celebrate devotees success stories. Preaching, business, community development, leadership and personal growth. All from the point of view of Krishna consciousness. Our goal, to help you to make your life successful. Hare Krishna and welcome to Episode 26 of Successful Vaisnavas. This episode, I'm going solo and we're talking about boiling the milk. The basic concept here is the importance of taking care of devotees and training devotees and looking after the devotees we have rather than just always going out and making new devotees. So yeah, as I said, it's a solo episode today. I've got quite a few things that I'd like to discuss on these podcasts. So I thought instead of always doing interviews, why don't I do a few episodes where I'm just sharing some of my ideas and then I'd love to hear your feedback on them. The easiest way to give the feedback would be to leave a comment on the website of this episode, which would be successfulvaisnavas.com forward slash milk or successfulvaisnavas.com forward slash 26. And of course the other way is if you go into the Successful Vaisnavas Facebook page, you'll find the post that is advertising this episode, that'd be a great place to discuss as well. So to extend on this, this idea of boiling the milk and really looking after devotees is linking back to another concept, which is the idea of the healthy church, because the idea came from the purpose driven church. It's looking at are we addressing all of the different purposes that our organization is based on. And so my feeling is that we're not taking care enough of the devotees and the children in our society, although we may be doing well in other areas such as festivals or perhaps reaching out to outside people. I think that this is an area we really need to develop, which is practical education and helping devotees to create a good lifestyle that supports their Krishna consciousness. So that's just a little bit of an intro and I'm planning to do a webinar on this. So depending when you see this episode, it may be too late, but at the time of releasing this podcast, it's just on the Wednesday coming up, which would be, not sure exactly, Wednesday the 27th, I believe, New Zealand time I'll be holding a webinar. If you are seeing this episode at a later date, you can go to successfulvaisnavas.com forward slash class to see what other webinars may be coming up at the time that you check it out. Or else you can just go to successfulvaisnavas.com forward slash milk if you're specifically interested in this topic. Yeah. So the idea is that I'll be sharing this idea of how to care for devotees and have a healthy, balanced temple. And in future I'm planning to do these regularly, probably once a month. I've already done one training called the Japa Jumpstart. It goes in total for about an hour, but I've also broken it up into different sections if you prefer to study it that way. And what it is is applying the Mayapur Success Formula that I created based on the Nectar of Instruction and applying it to managing our life so that we can chant quality Japa. First of all, to arrange our life to make the time for our sadhana, and then expanding on that to deepen our practice and make it more effective and higher quality. So that's one training that I've already done. Then this training will be the next one about developing a healthy temple, boiling the milk and training devotees. And then in future, we'll also be looking at how to use the internet to preach and also expanding on the Japa Jumpstart with some new ideas that I've been exposed to recently about how to develop good habits, which is really important in Krishna consciousness. So that's just a preview of what's ahead. So please come and check out the training that we're doing. Whenever you listen first, you'll be able to find the most recent training at successfulvaisnavas.com forward slash class. So for now, let's move into the episode. It's actually a podcast live that I did, but I know that not everybody may have seen it. And so that for the benefit of podcast listeners, I'm reposting it here and I'm planning to do that as well. Looking at some of the Facebook lives I've done in the past that may be particularly relevant for devotees in general. And I'll also add them to the podcast to make them easy to find. So with that said, let's go and boil the milk. Hare Krishna. Today we're going to be talking about boiling the milk. Why it's important to look after the members that we have, even more important than making new devotees. So let's go. I'm just getting to the temple for a meeting about the food festival and the colors, the Holi festival. So I thought I'd just talk while I'm driving and hopefully it'll make sense to you. Hopefully you can hear me. Just have to excuse me every now and then I'll have to make a few turns and I might even say, Whoa, okay, now we're looking at the wrong way. Okay. How do I switch it back. Okay. My phone holder is not the strongest in the world as you can see. All right. So I was listening to the podcast of Namarasa, he was interviewing Gopikakanta devi dasi and she wrote an article recently, which was about the second generation and how devotees who have been born in the movement, they need to at some point make the conscious choice that yes, I want to follow Krishna consciousness. This is my path. And she was talking about ways that we can try to bridge that gap and help the children to connect with Krishna consciousness and give them the opportunity or to encourage them to take up Krishna consciousness with their own initiative. And in that conversation, the expression was brought up to boil the milk. So what does boil the milk mean? Well, in a few words, that means it's an expression that Prabhupada used to say that we should concentrate more on the devotees we have and to increase the Krishna consciousness and the quality of those devotees more than we should focus on outreach. So the background to those particular statements of boiling the milk is a series of letters that Prabhupada wrote. He wrote them in May and June 1972. There's four letters that I found, been able to have a look at. Now because I'm driving, I can't read it out to you. Maybe when I stop in a minute, I might be able to read some of them with quotes directly from there. But the essence is like with milk, you start off with milk and there's two things you can do to milk. One is you can add water and it becomes less and less like milk until finally, it's basically only water. And the other thing that you can do is you can boil it. And what happens then is that it evaporates the water and it condenses the milk. It makes it more and more thick. It makes it more sweet. And this is what Prabhupada was saying in these letters. He was saying that we have enough devotees, we have enough centers. What we need to focus on now is making those devotees spiritually strong, helping them to become really Krishna conscious. And so this conversation or this topic was mentioned in the podcast with Namarasa and it occurred to me that one of the important elements of this, which was not really, it's actually mentioned in one of the letters, is focusing on children. In one of Prabhupada's letters, Prabhupada is writing to a devotee in Dallas and saying that "Yes, I agree that you should follow your proposal of focusing more on training the devotees that you already have and the children more than trying to preach to the outside people in Dallas. So yeah, this is the point. It's training the devotees who are joining as adults, as well as training the devotee's children who are growing up in our movement. So now you may wonder, well, why am I bringing up this topic? Well, the reason is that I think that this is an area that still really has not been given the proper attention that it deserves. I feel that there's still much more focus on bringing new people in disproportionately, and not enough emphasis on helping to cultivate the devotees that we have. So that's my key concern here. For example, Radhanath Swami, he tells one story about how he went to a temple and there was this man, he'd been coming to the temple for years and years and years and Radhanath Swami said, "Why did you not ever get initiated or why did you never join the temple or..." Whatever. Basically, to take it more seriously. And this person says, "Well, I observed the way devotees treat new people and I observed the ways that the devotees treated each other. And based on my observation, I felt that it was a better if I remain a guest". And, you know, I've seen this also myself. Sometimes there's irony in the way that devotees preach, for example, sometimes one devotee will stand up in front of everyone and go "Devotees, go into the back of the line. Guests first!" And the way that they do it is in such a harsh way that you sort of think to yourself, "Ok maybe it's better to be a guest", rather than thinking, "Oh wow, these people treat each other so nicely". It was actually the opposite experience, which is more of the feeling that, "Ah, yeah, I don't really like the way these people treat each other". So that the irony is they're trying to make the guests feel special and welcome, but in the way that they're treating the devotees they're actually giving them the opposite message. Another example of some of the ironies that I hear is that recently, my wife asked someone, a senior devotee, how they should speak when they preach and distribute books. And the answer was a really great answer. It was that you should listen to the person, try to find out about that person and then try to relate with that person so that when you present the book, they'll be able to relate to it. It'll be done with an understanding of that person. So the irony that I found in this particular conversation is that the person that was speaking was basically telling everyone this is how things should be done. But the whole time that he spoke and that we were with him, this senior devotee, I found very rarely did he try to understand where the devotees were coming from or to ask them about their opinion or their experience. It was more about, okay, look, I'm here to tell you how it is. And another irony is that this devotee is also someone who tells that "Devotees you should think for yourself" and then he proceeds to go and tell the devotees just how they should think rather than thinking, "Okay, so we want devotees to think for themselves". It seems to me, just from my point of view that if you want devotees to think for themselves, we should really be asking devotees "So what do you think? What are your thoughts? What's your idea?" So sometimes we may speak about an idea as a good idea, but in our actions we're presenting something else. Like, we're saying you should try to understand other people and get to know them. But all we do is speak and we don't listen. Or alternatively, we say you should think for yourself. But then we tell the devotees that this is how things are and if you don't agree with me, then you're a fool, which is kind of interesting. So anyway, these different ironies that we observe and it just highlights to me that we haven't really developed the culture where we're really learning to find out the needs of the devotees and address them. Just like if we want to preach to outside people, what do we do? We try to think what are their concerns, what are the things that they're interested in or how can we present something that will attract people to become interested so that we can present Krishna consciousness as a solution for that problem. So we use that idea sometimes when we go to market Krishna consciousness or at least we've spoken about it and applied by some people. You know like for example, when you distribute books, you go to someone and say, "Oh, do you ever feel stressed? This book is going to be really good for you because this book will help you to get free from stress". Something that people can relate to. But how often do we see devotees in the temple, or in our Hare Krishna community trying to find out what are the needs that devotees have in the community? How often do we find devotees saying what's going on for you? What are your challenges? What are your issues and what can we do to try to help address them in a Krishna conscious way? And related to this is I think that perhaps it was not as necessary in the earlier days from the point of view that everybody was living in the temple. The people that lived outside the temple were the exception. The devotees lived in the temple, they worked in the temple. Everybody ate together, they did service together. So there was a lot of opportunity to just naturally discuss with each other, develop the friendship, develop the community, talk about Krishna consciousness and just sort of discuss what challenges we might be facing and discuss with each other ideas about how we can preach or how we can help ourselves in our spiritual life personally. I'm just going to pull in here so I can just concentrate a little bit as I'm nearly at the temple. Whoa. This is a very busy cafe or supermarket I just pulled into, seems to be so many cars. Anyhow, let's just pull over here. Stop here for a second. I must get myself a watch. Let's have a look at the time, I guess a little bit of time. Yeah. So I've just got a few notes too that I wanted to refer to so let me just find a better position. All right, so I've covered a few of the points here abut how times have changed. Yeah. Devotees used to live in the temple, but now they don't, and so the needs that devotees have are different also. Previously, the life was very simple, but now devotees have got different lifestyles, excuse me. Yeah. Devotees might be working and their challenge is how can I share Krishna consciousness with my workmates? Or, how can I practice my sadhana properly when I have to go off to work early in the morning or what should I do when I've been invited to a work function and they're going to be serving meals, and how will I explain it to them and what should I do? Should I bring my own food or should I eat the food they offer? These are some of the challenges that were not as common in the earlier days when everybody lived in the temples. So I think it's very important as a society now that we take stock and inventory, what are the needs that devotees have these days. And of course it's going to be different in different places and different people. But the key factor here is finding out the needs of devotees and seeing how we can address them. And one of the key elements here is, as I mentioned earlier, when everyone lived in the temple, we would sit down and eat together. Now when you sit down and eat, it's natural that you'll converse with each other and discuss things. In fact, I often say that the real Bhagavatam class often starts at prasadam afterwards. Because in the Bhagavatam class, the communication is mostly in one way flow that the person on the Vyasasana is speaking, giving the ideas. But then the really interesting part comes when the questions come and the different ideas come backwards and forwards. So some devotees that give Bhagavatam class, they interact more with the audience. But whether that's the case or not, we often find that a stimulating Bhagavatam class leads to very interesting discussions at prasadam time. So when devotees are not living in a temple, they're missing out on that experience of that communal eating and post-discussions that will naturally take place. Or if devotees are working together, they can continue those discussions about the points that were raised in the Bhagavatam class. Of course we have Facebook and so there's a kind of a communication, but it tends to be of a different nature. I find that when we are discussing in person, there tends to be a little bit more authenticity, a little bit more, what's the word? We're just kind of speaking from our own experience. Transparency, maybe is the word. And it's more based on trying to understand. Whereas I find that often in discussions in social media, it's more of a battle, more of a argument that ah, okay, I disagree with his point. You know, when you're on social media, people sometimes won't post unless they feel they have something new to add and often or if they feel strongly about something, they're "Oh, this is the point that I disagree with, so I'm going to make my comment" or "Yeah, I totally agree with that statement. I'm going to support it". And it leads to this natural kind of duality and this disagreeing kind of mood on social media. But in person I find that it's a lot more relationship building and a lot more about trying to understand the truth and understand each other and get to know each other. So this is something that we're missing out on these days now that devotees don't live at the temple, don't live together. Yeah. So these are some of the things why I think that there's a need for us to really put our focus on boiling the milk in the sense just very basically of helping devotees to understand Krishna consciousness better and to practice it more, to practice it better. I've already mentioned about the next generation, but I just wanted to make another point that one devotee was bringing up this point recently, that if we really want to effectively preach, we want to do outreach, then we need to have a strong second generation. Of course we can preach no matter what, but just think about it, that if we are preaching to new people, become devotees, join Krishna consciousness, it's the best philosophy, the best lifestyle, best everything. And if all of our kids are leaving the movement, it's obviously something's not quite right. Now, I wouldn't say that's a situation. But the more that we can take care of our second generation or our next generation, and that we can provide for them both materially and spiritually, the stronger our movement will be and the more effective our preaching will be. Because when people take an interest in Krishna consciousness or any spiritual movement like this, they're gonna look and think, "Hmm, what are the children like? How are they growing up? Are they practicing this or not? And if they're not, why not? How are the children being treated? These are things that people will look at and notice. And if the children are not really being trained nicely and they're not growing up in a well-supported way, it's gonna turn people off. So I think it's very important. I remember, this friend of mine, devotee made this point that it's really important that we look after our next generation, especially that they become well situated in their life in terms of professions and mentally that they feel very secure and so on. Then a sarcastic comment was made back then "Oh yeah. So basically your idea is that we just don't bother about preaching. We just make the new devotees in the bedroom", which is a bit out of line. But from one point of view, yeah, it's a good strategy. You look at the Muslims, fastest growing religion in the world, how are they doing it? It's not really by conversion. They're just having big families. On another podcast with Namarasa, Kripamoya Prabhu was talking about how having big families is good if you're a devotee because we need more devotees. And it is a great way to make devotees because from the very beginning of life we can cultivate someone to be Krishna conscious. And so I think that to criticize that philosophy of spreading the movement by having families and making our next generation strong is missing actually one of the best strategies for strengthening our movement and making devotees. I mean, you just think about it like this. If you can cultivate someone from birth and develop them to become Krishna conscious, how much easier do you think that will be compared to finding someone out in the world who comes from a totally different culture and has a whole lot of bad habits and things like that and then they have to unlearn that and then become a devotee. If we can really put our emphasis on creating a society and creating an education system that cultivates our children and our youth, that is really powerful way to make our movement strong, to make more devotees just from those kids that had been born. And then from that position, our movement will be so attractive for outside people. So these are some of the reasons that I think it's really important for us to think about this issue of boiling the milk. Of course we don't need to give up our outreach. Outreach itself is a form of personal development. It's a form of surrender and it's a form of Krishna conscious lifestyle and expression. When we practice Krishna consciousness, we develop mercy. And mercy means that we try to share this with others. It's generosity, abundance mentality. So many reasons why preaching is a fundamental part of our Krishna conscious philosophy. But preaching doesn't just mean making new people into devotees. It means cultivating the people that become devotees and really developing them. And this is why I've many times talked about the purpose driven church. Because the purpose driven church is a very holistic approach. One of the things I really like about the purpose driven church, which is confirmed by Prabhupada is that they say that it's not about getting a big church. Now, the purpose driven church is the story of the Saddleback Church. It's huge. Many, many people joined that church. It's known as a mega church. But really early on in that book, it makes the point that it's not about creating a mega church. It's not about numbers you can have. It's about having a healthy church. And they make the point that if you want a child to grow, you can't force it. But if the child is healthy, it will grow. It's a natural consequence. Now you can artificially get a child to grow I suppose through steroids and things, but that would not be healthy. And that's not what we're looking for. We're looking for a society that's healthy and that health will naturally mean that it expands. Just like I was saying, if we look after our children and the next generation, it's natural that the society will grow. But our emphasis should be that when someone new joins our movement or whoever's already part of our movement, our focus should be on really caring for those devotees. And this is a point that Jayadvaita Swami made also in his series of lectures called Food for Death. Those lectures were talking about how we have to be careful not to think that mundane charity is equal to Krishna consciousness or that it's our main mission. And he said that if you have a desire to do charity, like to feed someone or clothe someone or give a donation, direct that towards serving the devotees. And when that happens, then naturally this movement will be very attractive. So there's more to say on that topic but I won't go down that. That may be another time we can talk about that. It's really interesting series of lectures and it got me thinking in some interesting ways about the relationship between looking after our devotees and preaching. So anyway, just quickly talk about just extract some of the quotes from Prabuhpada's teachings. And just before I do that, there's one other point I didn't mention. In marketing, they say it is like 7 or 10 times easier to keep an existing customer than it is to make a new one. So why is it any different in Krishna consciousness? Let's do whatever we can to really look after the devotees we have, so that when someone comes, there's no question that they'll leave and it'll just also make it much easier to bring in new customers. Another business mentor that I follow, his name is Stu Mclaren and he has this what he calls the circle of awesomeness. And the idea is that if you want to have a successful business, you find one or two people that you can work with, you create positive results with those people and share their stories. That is the best marketing, rather than trying to convince people through logic and reason that, oh, this is the best product, or whatever. You showthat look, these people have put into practice these ideas and got success. Why can't you do it too? So in Krishna consciousness, doesn't it make sense that we should do the same thing? That we really help devotees to be successful and then we share their stories. And so that was one of the points. I will just take a few of these quotes, Srila Prabhupada says that "One moon is better than many stars". So instead of having a huge number of people, let's really focus on developing one or two. People that have taken up Krishna consciousness, let's give our energy to really helping them to become the best that they can be. There was a devotee who was part of the Harinam preaching group and they have what they call the ripe mango approach to preaching. So what that means is that when they're doing Harinam and they find that there's a person who's particularly interested, they give a lot of energy to cultivate that person. Because they're reciprocated. And that's the person that when they put the energy in, they're likely to get a better result. And I think that this philosophy makes sense as well. When you see someone who's showing interest in Krishna consciousness, to put your energy and really cultivate that person. It makes a big difference because just one person who's really serious can become a great preacher. They can influence others, they can bring their friends along. This is much more effective of focusing your energy on the people who are the most favorable and the most qualified than it is to kind of try to preach to a random as many people as possible. So I just thought I'd mentioned that, that we're trying to create moons not many stars. Prabhupada was saying that why do we want to be careful about expanding too fast. It's because otherwise we might have devotees who do not understand and practice the real principles. I've had experience recently where I was listening to a devotee speaking and they showed that they didn't actually understand some really basic points. I'll probably bring up some of those points in future, it's not for now. But devotees often can practice Krishna consciousness for many years and not have the right understanding philosophically or perhaps in their practice, their understanding of what the standards are maybe not fully developed. They may be missing out in certain things. And that's why it's really important for us to train our devotees to understand what the proper standards are so that it doesn't become more and more watered down as generations go by. All right. Time is getting short. I'm supposed to be at the meeting already. So let me quickly bring out some of the other Prabhupada quotes. Prabhupada said that "Preaching work should be directed towards the children and devotees and not so much the Dallas public". That was the quote I referred to earlier. Prahupada is saying that what does it mean to train devotees or to boil the milk. It means to train them in the philosophy and the lifestyle of Krishna consciousness. I think this is really important, especially now that devotees have different kinds of lifestyles. It's really important to help devotees understand how they can live their life and understand the proper standards and the proper way of living. Not just the philosophy. The culture and the lifestyle is also really important. And it said that "Unless students become fixed up in their spiritual progress, what is the use of trying to expand so much?" And this is a really interesting one. You are the leader. You are very, very responsible for the spiritual well-being of all students. And I think that we all need to take up this understanding that if we have been a devotee for some time, it's our responsibility, our very, very important responsibility to help the other's spiritual well-being. And then Prabhupada said, "If we expand too much, we shall become weakened and gradually the whole thing will be lost". So these are the points to emphasize why it's important to boil the milk and how do we boil the milk. How do we train the devotees? Well, as I say, time is short. So let me just give a few quick ideas and I think I'll expand in another podcast, in another Facebook live. First of all, we need to try to understand what the devotees needs are and then address them. How do we address those needs? We can do it through structured courses just like Prabhupada wanted the Bhakti Shastri courses, particularly to understand the philosophy of Bhagavad Gita. In addition to that, I think that it's really important to have small group meetings. This is one of the key points in the purpose driven church. And from my experience, I can see that it really helps to fill in that gap now that devotees are not living together and having prasadam together. We need to give practical lifestyle training as Prabhupada had mentioned here. Things like financial literacy, how to deal with relationships, how to align our life so that when we have our job or what the work that we do, that it's compatible and favorable for our Krishna consciousness. Training in business, training in how to be a good parent, training so that parents and children can work together to become Krishna conscious. The children will only become Krishna conscious through their relationship with someone and particularly their parents. So I think it's really important to train parents and children how to work together to be Krishna conscious. Apprenticeships, mentorships, and having coaches who can be a life coach for devotees that they can help them to design their lifestyle. And even business coaches and mentors to help devotees get into businesses that will be favorable for their own Krishna consciousness. To employ devotees and also spread Krishna consciousness. And finally, it's really important to develop gurukulas and educational systems for training devotees from the very beginning of life. So I really rushed through those sort of practical suggestions. Today's talk was mostly about the need of understanding devotee's needs and boiling them up in the sense of training devotees in the philosophy and lifestyle of Krishna consciousness. So, please leave your comments. If you are watching on Facebook, please put the comment underneath the video. If you listen to the podcast, then you can leave a comment on the website. It'll be successfulvaisnavas.com forward slash milk. And let's just keep this in mind. 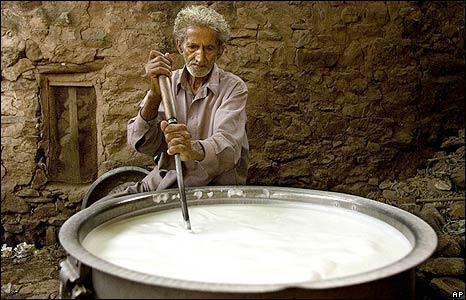 What can we do individually and as a society to help boil the milk? To help out devotees to become stronger in the philosophy and in the practice of Krishna consciousness. Sri Prahlad: What ever little service that anyone can do for Krishna is to be appreciated and celebrated. Akrura Prabhu: We know that they have much more potential than they are presently using. Srila Prabhupada: You just associate with pure devotees, then you shall be able to cross over the ocean of nescience. Click here to register to the Healthy Temple webinar.